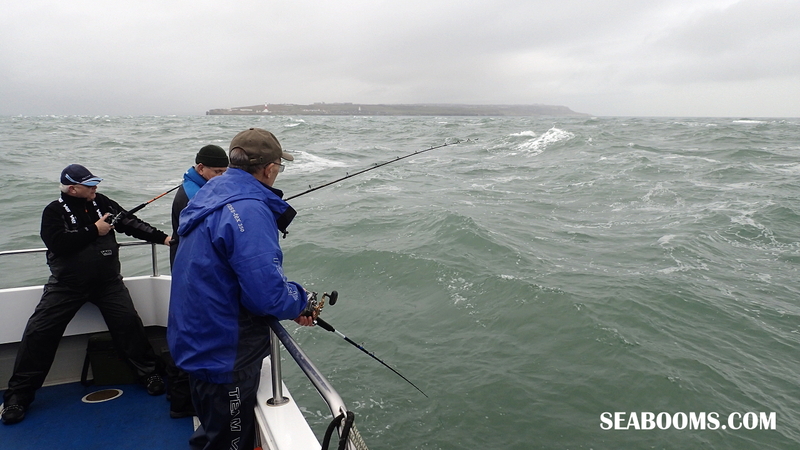 Where to fish around Poole in Strong SW winds Does Size Matter? 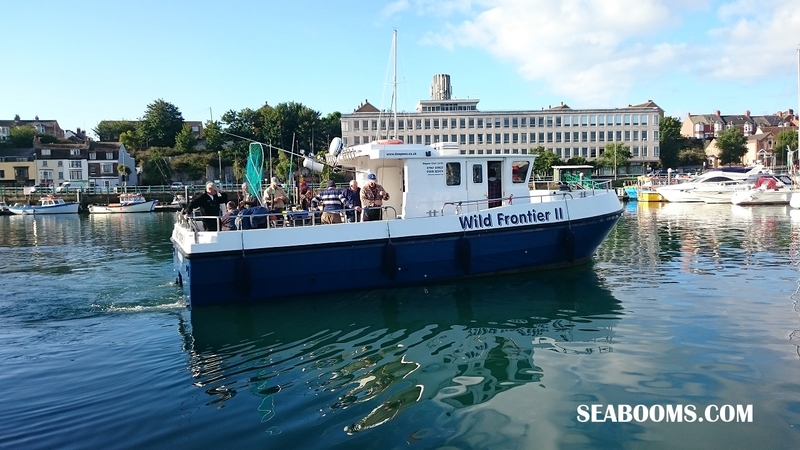 First trip out for some time down to the unsettled weather cancelling many previous trips, day looked promising with sky’s clearing and very little to no wind out on Wild Frontier II from Weymouth skippered by Clem Carter. 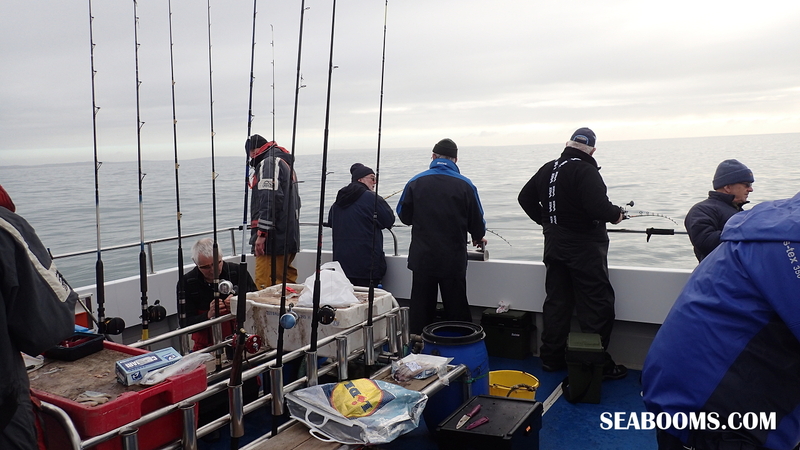 Crew all new faces and very expeirenced anglers 9 in total but on this boat space isn’t an issue as you can fish all round the main deck and forward plus down the sides of the wheelhouse. Portland Races was the first mark see if we could find the Bass using lures and I tried my new UV lumi lures and a variety of others by the crew But ! no bass. Heading west to a mark see if the Whiting where showing and fishing on the anchor and a chance to try the sampler rods and reels plus the low cost braid I had loaded them with. Using a very small set of Hokai tipped with Calamari strip and a 5oz weight, first drop into a fish infact two and believe it or not Mackerel this late in the year. 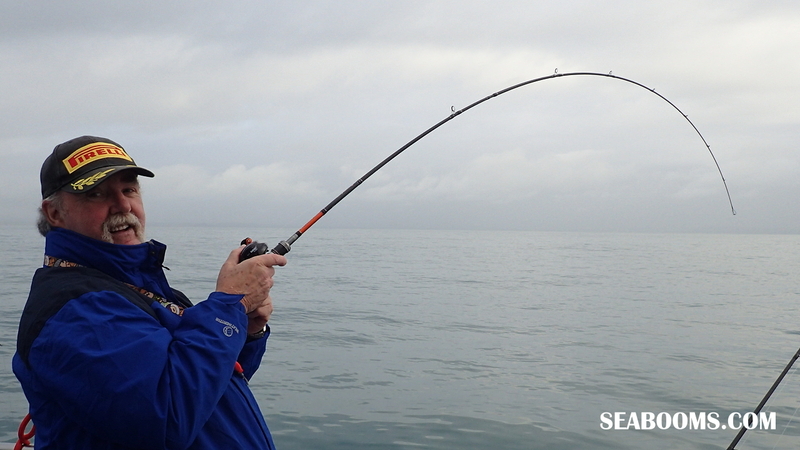 On this light rod it was good action, many more fish taken along with Whiting and Scad. The skipper started the live bait tank up and after filling that up with Joey’s we went wrecking see if there were any Bass to be tempted on live bait and I had chance to trial the rod and reel plus new flutter jigs down to 5oz size. Bingo found Pollock and some real chubsters too into double figures and the test rod stood up well, great fun in fact and so much easier jigging 5oz on light gear than the usual 10 or 12oz rigs. 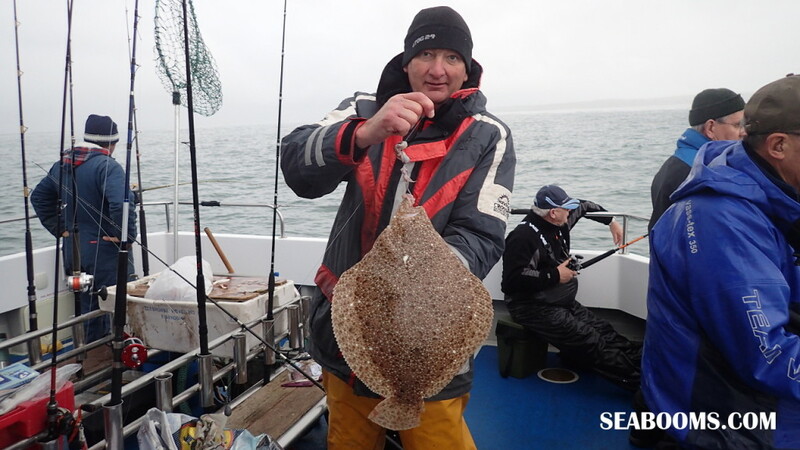 We tried the Races again couple of drifts but still No Bass and then finished the day on drfiting the Shambles were nice Brill and small Turbot came up and returned to fight another day. Weather not as predicted albeit a calm window sea mist closed in and fine drizzle but Hey we got out fishing and had sport so another good day at Weymouth. 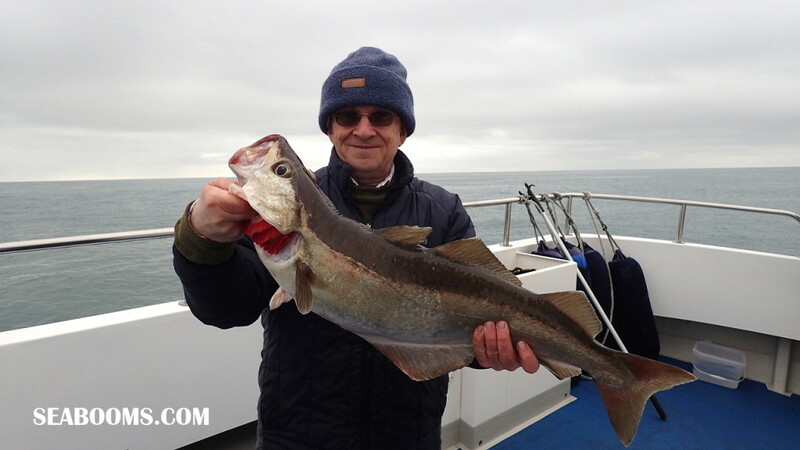 5 Responses to "Winter fishing on Wild Frontier II out of Weymouth with boat angler Allan Yates"
Thank you for the interesting read but it was strange to see that one of the photos, showing very rough seas, must have been taken on a totally different day and raises doubts on the authenticity of the article? Glad i wasn’t out on that day . 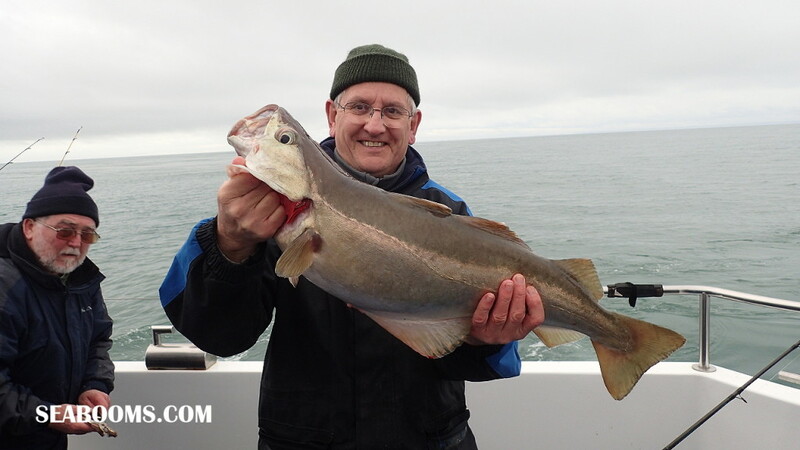 You will see just above the rough sea photo Allan mentions Portland Race this is a tidal run which is great for Bass but often extremely rough! Portland race is caused by the very strong south-going streams from both sides of the Bill meeting the east- and west-going streams off the bill, and its violence is increased by the sudden decrease in depth off the bill and inequalities of the bottom on Portland ledge.